Slap Ya Mama has been crafting top of the line quality cajun seasonings and recipes from Ville Platte, Louisiana for decades. A Family Business, Jack and Joseph Walker carry on the traditional cuisine of their grandmother, Wilda Marie, and their dad, Anthony. With a lower sodium content than most national brands and multiple blends to choose from, you're sure to find something to love! Check out Slap Ya Mama's seasonings, hot sauces, meal kits, and gift sets for your own slice of Lousiana. LOW SODIUM: At 100mg, this is a low sodium solution that doesn't compromise on taste. ALL NATURAL: Made of all natural ingredients. MSG and additive free. 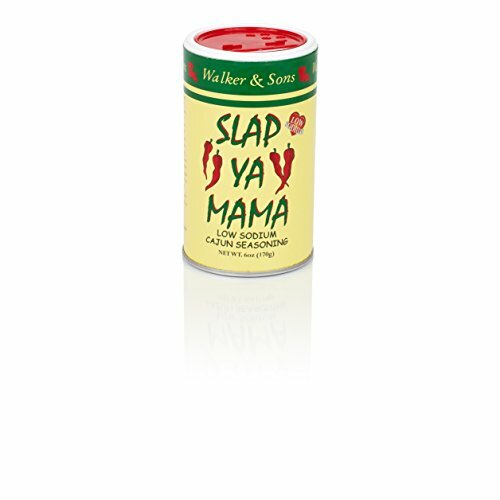 AUTHENTIC CAJUN TASTE: Slap Ya Mama's unique blend of Cajun seasonings & spices bring any dish to life with amazing flavors. VERSATILE AND EASY TO USE: Not too spicy and full of flavor, this mix can be used on any dish. Remember, if you can eat it you can "slap" it! FROM OUR FAMILY TO YOURS: Slap Ya Mama has been crafting top of the line quality cajun seasonings and recipes from Ville Platte, Louisiana for decades. If you have any questions about this product by "SLAP YA MAMA", contact us by completing and submitting the form below. If you are looking for a specif part number, please include it with your message.